I strayed a little from the recipe as written simply because of what we had (or didn’t have) on hand at home. I used a green Anaheim pepper instead of a small red pepper — I love the full flavor of them and the mild spice profile. I also added a bit of lemon to brighten the whole affair. And if you’re using Greek yogurt from one of the single serve containers, it’s likely it’s only 7 ounces. This will work just fine; it’s what I used here. If you don’t have hazelnuts, This would also be great with toasted walnuts or even pine nuts if you have them around instead. Preheat the oven to 375°. Place the beets on top of a large sheet of aluminum foil and fold the edges over to create a pouch (the beets should be completely enclosed in foil). Lay pouch on top of a baking sheet to avoid any dripping onto the bottom of the oven and roast until tender, about 1 hour. Let cool slightly. Slough away the beet skins with your fingers and discard. Cut beets into wedges and transfer to a food processor. Add the garlic, chile pepper and yogurt and pulse until blended. Add the olive oil, maple syrup, lemon juice and za’atar and puree. Season with salt. Scrape into a serving bowl. 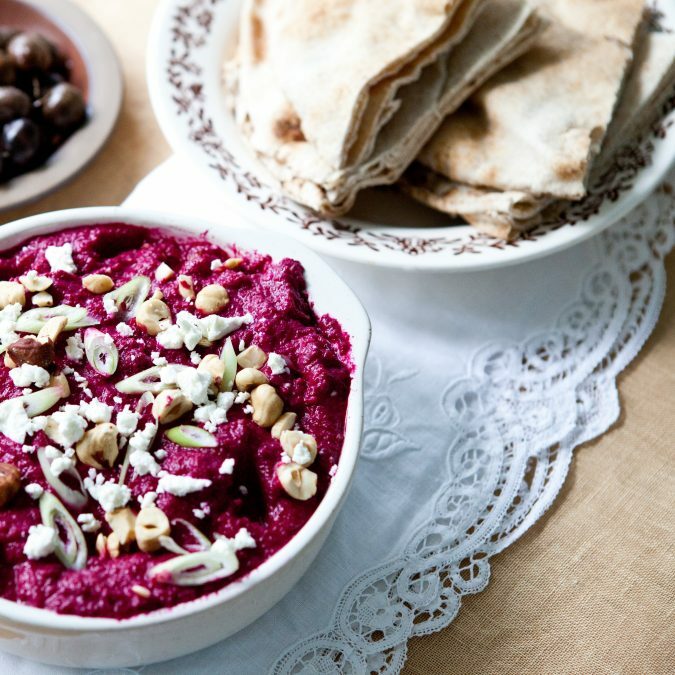 Scatter the hazelnuts, goat cheese and scallions on top and serve with pita. Store leftovers in the refrigerator in an airtight container for up to 4 days.